Tatsoi – Before we start: you’ve almost certainly eaten tatsoi before. The mild, mustardy leaves often show up in mixed salad greens, so — surprise! — you’re probably already acquainted. What’s so great about this green? 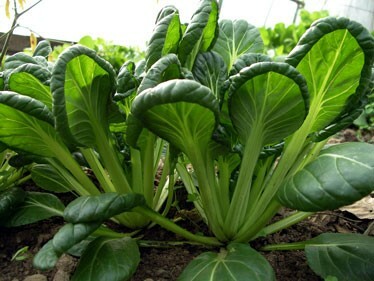 Once you track it down, (aliases include tat soy, tat soi, broadbeak mustard, spoon mustard, spinach mustard, and rosette bok choy), it’ll quickly become one of the most versatile green vegetables you know. On Friday, I realized I talked to Anne via IM while eating breakfast, lunch…and then dinner. She’s down in Louisville and despite the distance, I do my best to get my full Anne-quotient filled everyday. I could not figure out what to make for dinner. Sometimes, we are dinner twins. I planned to make the carrot soup she’d also made (her dad’s recipe, to be featured on here in the very near future), but discovered only one carrot in my fridge. ONE. I confessed I kept opening to the fridge and staring into it, blankly, without a single thought in my head. Anne: Do you have spinach, blueberries, couscous and almonds? Me: All. Wait, I have only cashews, hazelnuts and walnuts for nuts. And so, this is how it usually goes. She instructed me on a salad (I used the cashews I had) with a honey and white balsamic dressing. It was nothing short of amazing. Anne had a good point too: while I’m over here halfway through my marathon schedule, she’s busy cranking out miles on her bike (read: a LOT) and we both could stand some extra carbohydrates. Good call on the couscous! I’ve made it 4 times since then. Yes. I used all the blueberries in the house, too. Whoopsie. Cook your couscous according to directions. I made extra, so I could make another round of this the next day. Anne started with cold couscous, but since mine was freshly cooked, I just went with that. 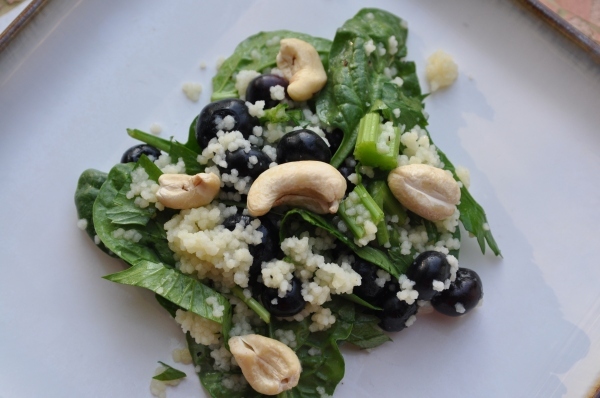 Place spinach, blueberries, cashews and celery in a bowl. Dump the couscous on top. In a small bowl, whisk together your dressing. Pour over everything and mix well. Add salt and pepper if you’d like. So, this makes (if you’re me) one serving. I am eating everything in sight, and right now, I prefer gigantic amounts of produce. I feel so much better when I have a lot of vegetables. I’m just going with it. Sometimes I make organic meat or fish with dinner. Sometimes, I don’t. After an 18 year stint being vegetarian, I still lean that way, as you know. So sometimes, I don’t really remember that I forgot to “make meat”. And that’s ok with us! We try to live by the idea that you shouldn’t take more than you need (this applies to both meat consumption and taking too many papertowels). Does that sound preachy? Not really meant to, but with overfishing, and the practices of most farms…it can be downright scary. Know your sources, I say. And who needs 3 servings of meat a day? Well, it’s not us, we know that much. Somedays we can’t get enough fish! Other days, we don’t notice we didn’t have any. But sometimes, I make a delicious dinner and realize – hey! I didn’t even add cheese. That kind of feels like a win to me, espescially when it’s so filling and SO GOOD. I love being all flexitarian (I went there!) for reasons like this dinner, right here. Mix salad ingredients together (in portion sizes needed), and lightly dress if desired. I can tell you I’ve made this salad three times in the last week. I took it for lunch twice with a 1/2 cup of cottage cheese on the side, and it was seriously delicious. I don’t kid about food being good. My inspiration for this next dish came from Cate, of Cate’s World Kitchen. I know it’s not really the same, but credit where credit is due. And this was my jumping point. While the quinoa is cooking, sautee the kale and mushrooms until the kale is pliable and the stems are easily chewed (about 10 minutes). In a blender/food processor, combine the pesto ingredients and puree until smooth. Combine quinoa, kale and mushrooms and pesto. That’s about it! We got fiddleheads, rhubarb and another round of eggs today (full pickup begins June 9th! Whoo hoo!). I was planning on making caponata for dinner (with fish? whole wheat pasta? I was a slightly unsure of what I’d pair it with, but Michael was requesting), however, the Trader Joe’s eggplant we bought went bad (very frustrating), and I couldn’t bear to have those fiddleheads hang out another minute in the fridge. Also, I was out of other ingredients. So,the answer was easy, really. I did a quick Foodgawker search for inspiration, and found a couple of things that interested me. Also – Oh She Glows (you know I love her) had a recipe featured on the front page of Foodgawker, and I realized I had everything to make it. So, I made that for my lunch tomorrow, and we had a bit along with this, for dinner. Yes, I felt like you needed all of the little details. Place the spinach in a bowl. In a saute pan, heat your oil of choice (I have been using coconut a lot lately, for the health benefits), and add the fiddleheads and cook about 5 minutes. Add salt and pepper to taste and about a tablespoon of balsamic. Simmer for about 1 minute more and remove from heat and put on top of spinach. Add feta. In a simmering pot of water, poach 2 eggs. To do this, bring water to a boil, and add a splash of white vinegar. Reduce to a simmer, and make a little whirlpool in the pot. Crack an egg into a small bowl (it’s easier to add to the pot like this) and then add to the whirlpool of simmering water. Cook as desired. I like to leave them in about 3 minutes or so. Remove eggs with a slotted spoon, and place on top of salad. Drizzle a little balsamic over each serving. And that’s it!